In the 16th Century, the Catholic Church's stance regarding translations of the Bible was the same as it had been for the previous 1,000 years. The only Bible officially recognized was the Latin Vulgate. This was a version translated by a scholar named Jerome around the Year 400 AD. It would be centuries before printing was invented, so as the years progressed, thousands of copies of the Latin Vulgate were copied by Scribes for use in Churches and Monasteries. in an effort to "improve" the text. Passages in one Bible book were replaced with passages from another book in order to add consistancy to the text. Words and phrases that appeared to be in contradition to the Church's teaching were modified. These types of changes were almost impossible to undo, so over the years, as more copies were made from previous copies, various versions of Jerome's original Vulgate came into use. This Bible, which included just the New Testament, was an attempt to show the changes that had crept into the Latin versions. It was printed in London in 1585 by Henry Middleton. Two different versions were presented — neither being the exact Latin Vulgate. Both were new Latin translations created from the original languages. The left column shows a version edited by Theodore Beza, a Catholic-turned-Protestant, who was a well-known scholar, poet and humorist of the time; his book "The Christian Faith" became a best-seller during the Protestant Reformation. 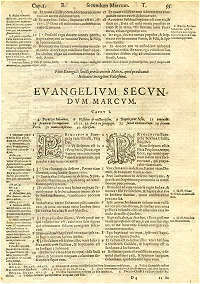 In the right column is the work of Immanual Tremellius, who also became a convert from Catholicism to Protestantism. His version was translated from Hebrew and Syriac. Click the picture to the right to view an enlarged page and a closeup view. You don't need to be a Latin scholar to see the differences in the text. It is doubtful that the Catholic Church appreciated this volume. Here we have two Protestants making changes to the Church's sacred Latin text. During those days of religious intolerance, it's not surprising that this Dual Latin New Testament ended up on the Catholic Church's List of Forbidden Books. Select another Topic from the list at the left, or return to our Main Menu.